This is it, the tour day. Started with breakfast at hotel. We got breakfast included in room rate so it’s very convenient because we didn’t have to go out to find breakfast. The food from hotel was okay. Many choices to eat. For the drink, you can get from drink counter or order ice coffee to the waitress. We were supposed to meet a friend and her family today. She will be arrive at 10.30 am. While waiting, we decided to walk around the hotel towards river area. The view was really nice. 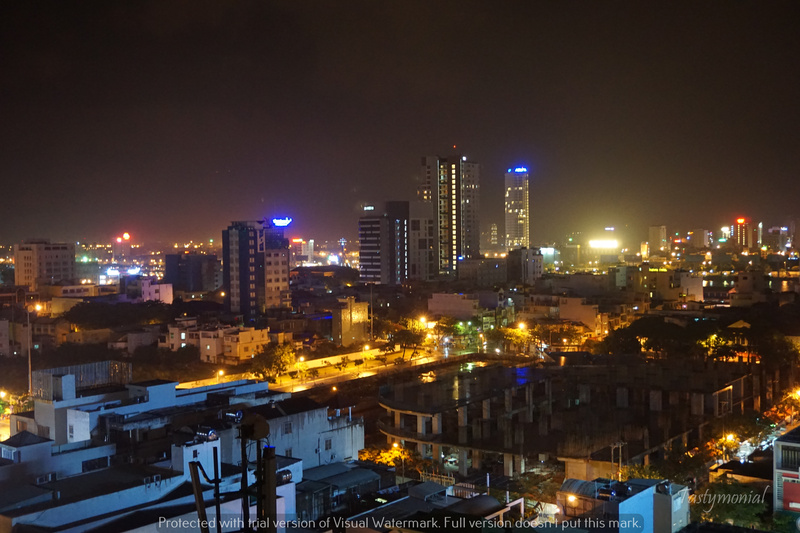 Should go there at night or at least choose a hotel with this view. I heard the skybar in Novotel Hotel has the best view of the river, but I didn’t have chance to try it. The weather was really nice, the sun was sooo bright I felt really hot. We walked back to hotel, and met our friend. The tour guide was already arrived as well. We introduced ourselves, talked for a bit and ready to go. The tour guide told us to bring warm clothes or jacket because it’s going to be cold on BaNa Hills. So we brought our jacket and ready to go for the adventure! But before that, we had to have lunch first, early lunch at 11.00 am. The tour guide brought us to Apsara, a Hindu restaurant. They are serving vietnamese food, and it’s good. The menu was already been decided by the tour, so we only need to wait for the food to came out. They were all delicious! Tummy full and it was time to go to BaNa Hills. 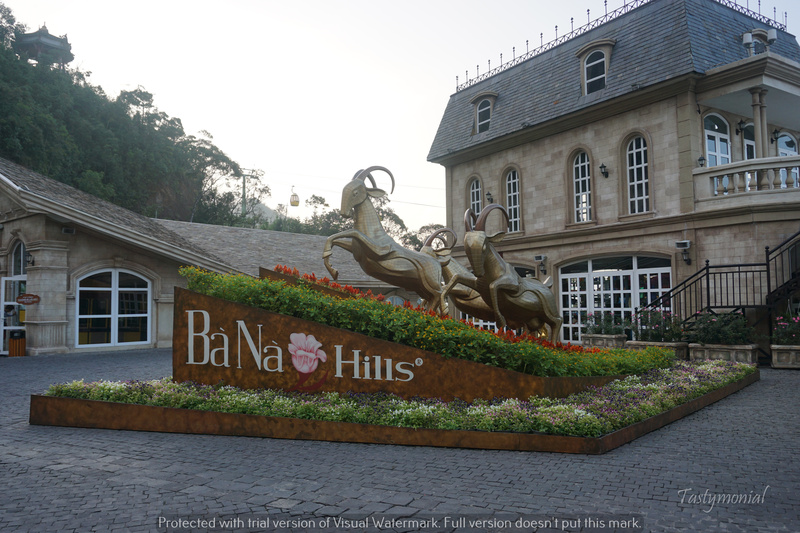 We arrived at BaNa Hills Mountain Resort after 45 mins driving, not so far from the city. 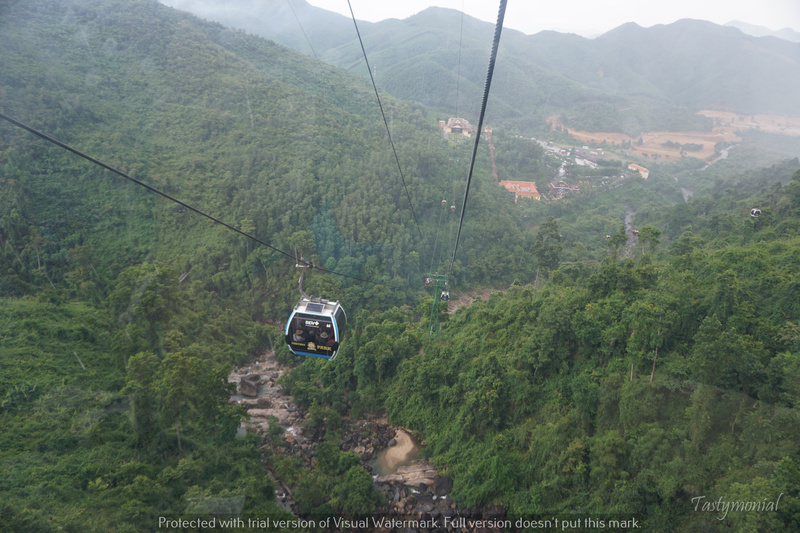 We need to take cable car to reach the resort. 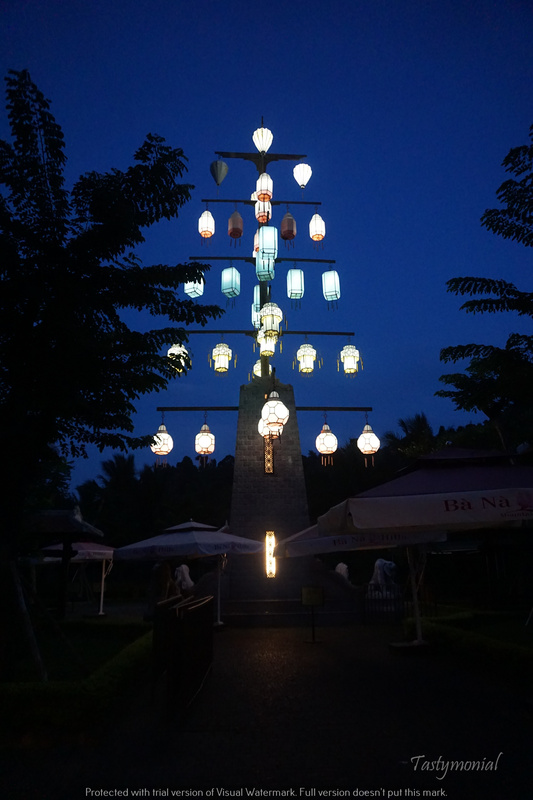 The entrance fee for adult tourist is 550.000 vnd. For more details, you can check on BaNa Hills website. The cable car there got a guinness book of record certificate for being the longest and the highest cable car. It is 5 km long and 1.2 km high! 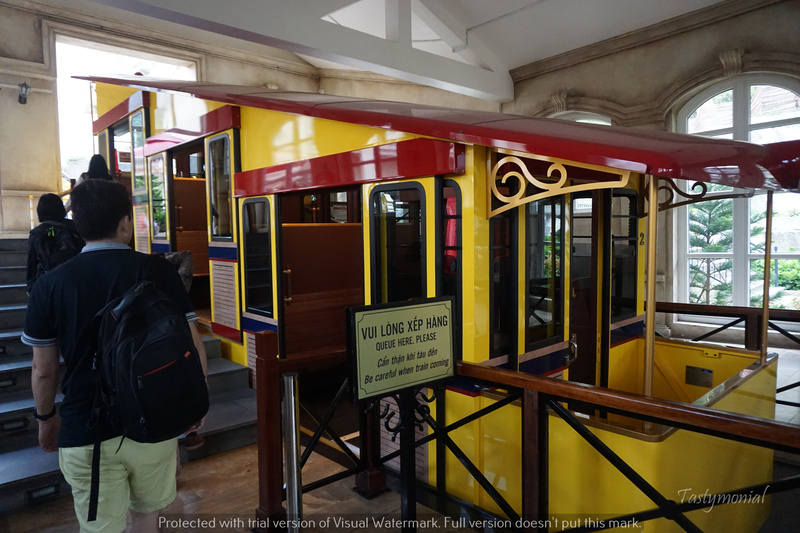 One cable car can fit 8 adults, so our small tour can get into 1 cable car together. Our tour guide said it can fit 10 adults, but as we sat in it we thought it’s not possible lol. The cable car moved quite fast! Even faster than the one in Ngong Ping, Hong Kong. It swing a bit too, maybe because of the wind. I was scared sometime when it swing. The view is really gorgeous, I can see mountain, river, waterfall, forest. Enough to differ my attention from the swing. 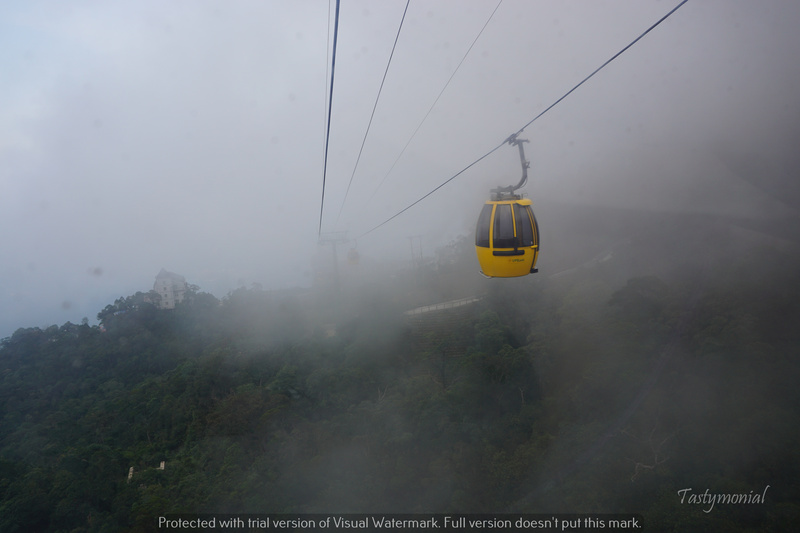 Too bad it was raining half way to the top, couldn’t take picture nicely cos of the water on the cable car’s glass. The journey took around 20 mins. Yes, it is long. If you are afraid of height or acrophobia, don’t look down. Ever. 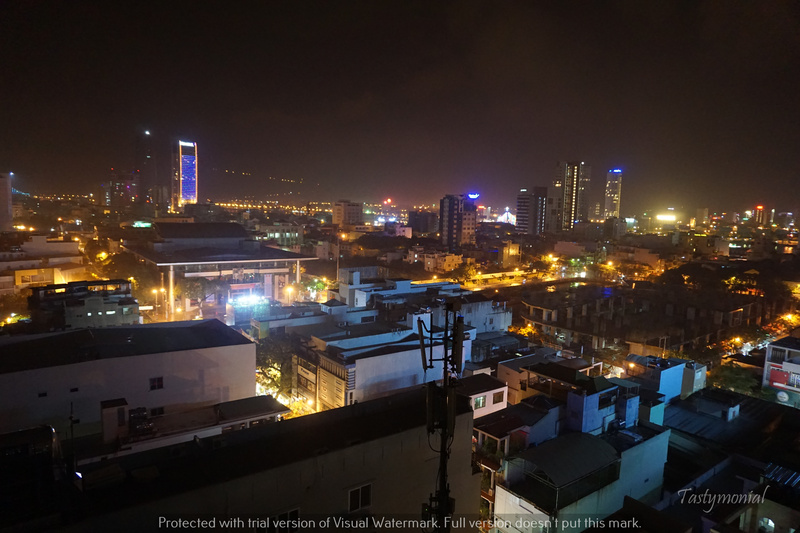 Just enjoy the view around, talking with friends or taking pictures. First building we visited was the church. It’s a smaller version of Notredame Paris. It’s a real church, not just a decoration. We have to maintain the silence inside. Many people were praying as well. Second visit was the temple. A lot of stairs, a very good exercise but also tiring. There are many places in the temple site. We went to all of the places there. My favorite is the high tower on the left side, where I can see the whole park and temple site from above. It was a very nice view from the tower (if it’s not foggy). Next visit was Fantasy Park. An indoor game center. Everything here is free to play. Except for Wax Museum, or game with prizes. Entrance fee for wax museum is 100.000 vnd per person. It is not madame tussaud. The quality of wax is okay but still can’t match madame tussaud. After that we tried a 5D attraction. The story was about cowboy. We sat on a horse saddle, put on 3D glasses, and held a toy gun. After waiting for some people to came in, the movie started on screen. We can shoot on the screen and get a point if hit the right target. The saddle also moving like we were riding a horse. At the end of the show will have the highest score and top 10 scorer with picture of the person. Quite fun experience. 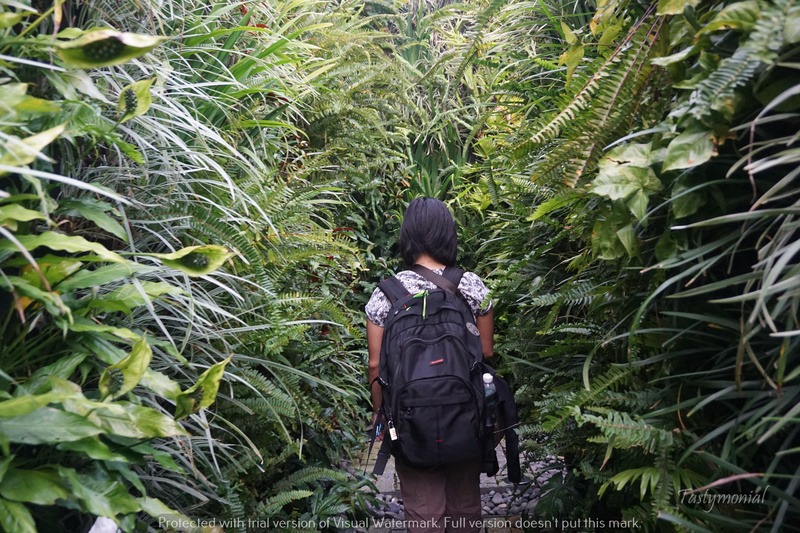 Our tour guide hurried us to see flower garden, even after we said we didn’t want to see it. So we moved to exit and on the way we saw a Dinosaur park. We decided to take a look. It was a small area full of dinosaur statue. They made it pretty good though. After exit the fantasy park, we saw a cable car ride on our right-hand side. I wanted to go but they were closed already, due to maintenance. It was nearly closing time for all attraction as well. They were closed at 5.30 pm, all of them except for restaurants. That is why our tour guide hurried us to go. We took a cable car again to the train station. 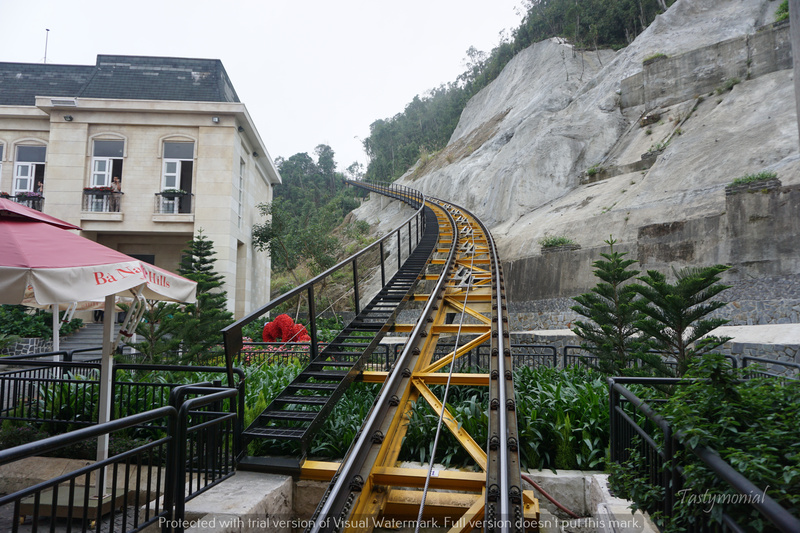 We need to take train / funicular to flower garden and paid for 70.000 vnd per person. Last train to go back from the garden is at 5.30 pm. Arrived at the garden after 1 minute funicular ride. We saw many people on the line to go back from garden to the peak. We were the only group that came to the garden at that hour (It was 5.00 pm). So.. we walked faster to see around the garden. There are old wine cellar, that was used before by French family. We saw the gardens. It’s like a miniature of Versailles (a very small version of it though). Took some pictures then went to secret garden. It’s a maze.. we were a bit lost inside, but fortunately we could go out fast enough. Next we went to see the temple. There is a big Buddha statue, and if we go down the path we can reach the monk area. Yes, real monk lives here. We hurried back to the funicular to take us back. Noone else around, only us. This is the first time I become the last guest in a place lol. When we arrive at the station, the plan was taking a direct cable car to entrance area but they were not operating anymore, already on a break. We need to go back to the park area and take cable car from there. I thought last trip to entrance was at 9.45 pm but why were we in hurry?! Apparently they are closing the cable car at 5.30 pm for maintenance and to relax the wire. They will open again at 7.00 pm, so if we missed the 5.30 cable car, we need to wait til 7.00 pm there. That was why we were in hurry. We were the last guest to leave the park at that time. Going back to the city took another 45 minutes. On the way we were thinking about where to eat. We wanted to eat somewhere with river view because it’s really nice at night. Many ideas were coming from tripadvisor and foursquare, but we still not sure which one is good, so we decided to ask the tour guide. She recommended a restaurant, seafood restaurant. At first we thought the restaurant has river view, but it’s not. When we asked her where is the river view, she said “You can’t see river from here, but they have a show inside and good seafood”. Okay..so she only got the “good restaurant”, while we asked for “good restaurant with river view” lol. Since our stomach already really hungry, we decided to try it out. Their price is quite expensive, but some of the foods are good. From our table, we could see the small stage where singer and dancer are performing. We could feel the local atmosphere, but the restaurant itself doesn’t look local. It is very extravagant design. From the entrance to dining tables is quite far, and we need to passed by a bridge as well with many marble statues. After dinner, we headed back to hotel. Sore body and legs. Time to use the spa voucher. We made the appointment first via phone (recommended to do so). The spa is on 4th floor of the hotel. For complimentary spa (which we did), we can choose between leg relaxation, shoulder neck back massage, or shoulder neck head massage. The massage lasted 30 minutes, and it was a good massage! This is the first time I felt sleepy while getting massaged, and not in pain. That was all for first day, happy tummy, happy legs, happy me ^^.